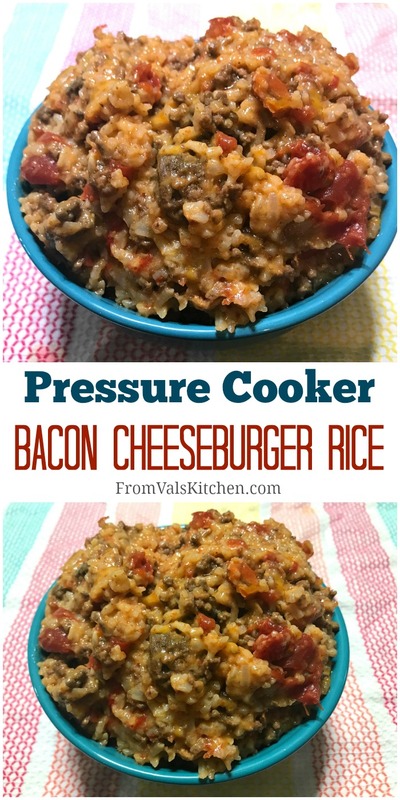 Pressure Cooker Bacon Cheeseburger Rice is a one-pot meal that the entire family will love. It’s super easy to make, and is ready to serve in just about 30 minutes. This tasty and filling meal is naturally gluten-free using ordinary ingredients. I have another recipe made with an electric pressure cooker for you! And with it I have a review of another new electric pressure cooker, the 8-quart GoWISE 12-in-1. The GoWISE 12-in-1 Electric Pressure Cooker has 12 preset features that make for getting a fast and easy start to cooking your meal. The settings are Bean/Chili, Canning, Egg Maker, Meat/Stew, Multigrain, Porridge, Poultry, Rice/Risotto, Seafood, Steam, Veggies, and Yogurt. There are also two additional functions, one for saute and one for slow cooking. Pressure for all settings can be switched between low, medium and high. You can set the time for any cooking cycle manually, and there is a timed delay available as well. The GoWISE comes with the electric pressure cooker with stainless body and lid, and a ceramic copper pot. The unit has a detachable power cord. The product also comes with a measuring cup and spoon, stainless steel rack, 2 steam baskets and a booklet of 50 recipes. Functionally, if you’ve used another brand of electric pressure cooker you’ll easily get accustomed to using the GoWISE. If you haven’t used an electric pressure cooker before then there is a slight learning curve, as the instruction booklet is super basic and contains explanations of the parts and cooking times, but not really anything in-depth on how to use it. I’ve used 5 or 6 other brands so I had no problem figuring it out. The only hiccup I ran into while using it was with the lid, the first few times I used it I had a difficult time getting it to seat and close. One feature that the GoWISE has that I haven’t seen before is its pressure release button. So far all of the other pressure cookers I’ve used have a pressure release valve that needs to be turned, whereas the GoWISE has a button you push down similar to that which you’d find in a tea kettle. Having a button like this omitted the need for tongs to turn a valve and decreased the chances of accidentally burning an arm or hand when it got into the path of extremely hot steam. The 8-quart size is exactly what people with large families will want, as well as those interested in meal prep, batch cooking and entertaining. The inner pot cleaned up nicely each time I used it, requiring no effort at all to remove particles of food with only a sponge. The pressure cooker does have a built-in holder for the paddle spoon it comes with, which makes it easier to find that spoon when you need it then it would be to hunt for it in a drawer. Here’s a brief video from GoWISE on the model. You can learn more about this 12-in-1 Electric Pressure Cooker and other products on the GoWISE website. You can keep up with GoWISE on social media, on Facebook, Twitter, Pinterest, Instagram and YouTube. You can purchase the GoWISE on the GoWise website as well as on Amazon. 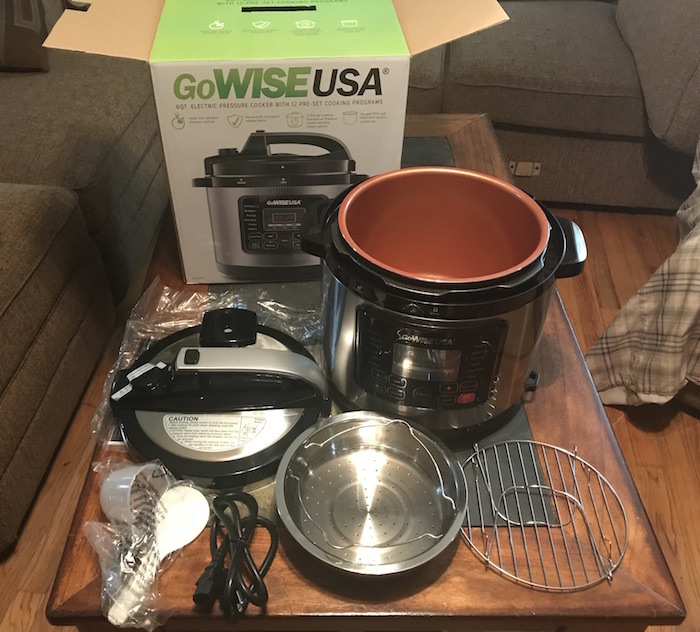 I’ve used the GoWISE 12-in-1 Electric Pressure Cooker to make a number of meals now. 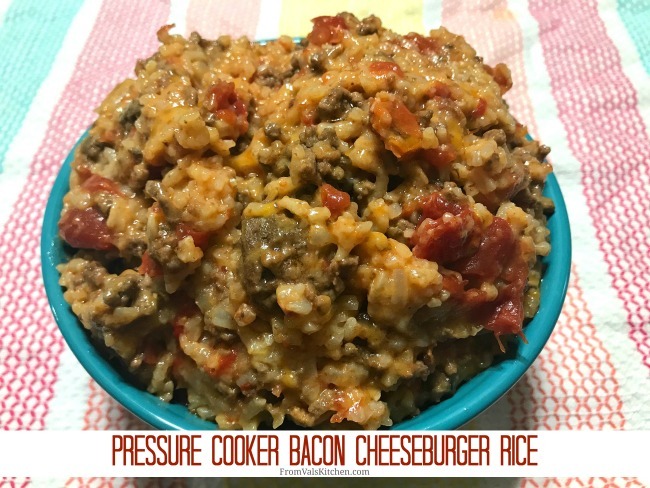 The first I’d like to share is my recipe for Pressure Cooker Bacon Cheeseburger Rice. 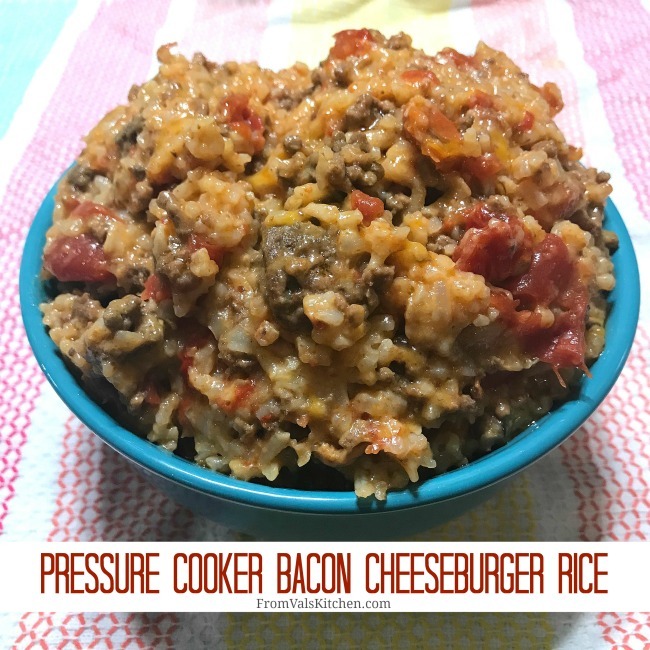 Pressure Cooker Bacon Cheeseburger Rice is a one-pot meal that the entire family will love. It’s super easy to make, and is ready to serve in just about 30 minutes. This tasty and filling meal is naturally gluten-free using ordinary ingredients. Here’s how I make it. Set the pressure cooker to saute and brown the beef. Once the beef is browned add in the broth. Now add in the rice, bacon and seasonings. Finally, add in the diced tomatoes. Set the pressure cooker to cook for 8 minutes on manual high pressure. Add a little more than half of the shredded cheese to the mixture and stir well. Serve immediately, using the remainder of the shredded cheese as garnish. Place the ground beef into the pot. Set the pressure cooker to saute and brown the beef. Once the beef is browned add in the broth. Now add in the rice, bacon and seasonings. Finally, add in the diced tomatoes. Set the pressure cooker to cook for 8 minutes on manual high pressure. Once the cooking cycle has finished do a quick pressure release. Add a little more than half of the shredded cheese to the mixture and stir well. Serve immediately, using the remainder of the shredded cheese as garnish. Enjoy! Bacon? Yes please! I tend to love anything with bacon in it. This looks like a delicious meal that my family will love! I love that it takes only 30 minutes to put this meal together and that’s it. This pressure cooker makes anyone’s life easier. The recipe sounds SO yummy! It has all the ingredients we live to eat. Hamburger, bacon and cheese. This is a dish the whole family would enjoy. Now that looks very filling. I bet my husband would love this. I will have to give this a try and make it one of these weekends. Love my pressure cooker. It’s nice to spend a few minutes and prepare a tasty hearty meal for my family without having to stay in the kitchen all day long. A bacon cheeseburger recipe you can eat with a spoon! Fantastic. I am going to try this recipe. Anything with cheese and bacon is always a winner in my family. Talk about a good dinner idea. The recipe is really easy to make especially with a pressure cooker this good. Ohhhh. I totally want to eat this! It has everything that I love in a meal. I never thought that there are so many great recipes to do along with pressure cooker. Now, I am really tempted to purchase one. I swear I want a pressure cooker so bad. I keep talking to Babe about it but apparently, he hasn’t gotten the memo as of yet. This looks delicious, I’m generally down for any recipe that calls for bacon. This looks so good! Sounds like something my kids would love! Thanks for the recipe, I’ll be making this one soon. I have to look into getting the GoWISE Pressure Cooker. It looks like a wonderful kitchen investment. Now this looks like my kind of recipe! I need to get a pressure cooker ASAP!! I like that GoWISE has the unique pressure release feature. 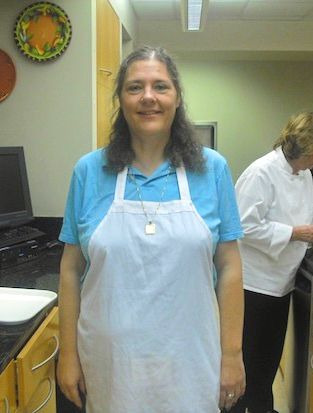 I am shopping around for a pressure cooker and I may just have found the one here! I can’t eat without rice. This looks really tasty and very delicious. I would love to try that of course! That is a nice looking pressure cooker. It’s amazing what all products like this can do these days. Much safer than the old pressure cookers. I love this recipe. So much hearty goodness inside! Anything that has the words bacon and cheeseburger in it has to be amazing. I would really love to eat this one up. I’m a huge fan of filling recipes like this, and I love the fact that it’s easy to make. I can just imagine making this especially when we have people over for dinner but barely have time to make anything! A pressure cooker like that can help you make a lot of good food!